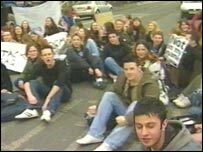 Two Leeds students have been suspended for urging pupils to walk-out in protest over war in Iraq. Sixth formers Sachin Sharma and Carey Davies were told to go home by Prince Henry's Grammar School in Otley after teachers learned of plans for the demonstration. Sachin, 16, said he had simply spoken up in favour of protesting against the potential war. He said: "The majority of our school does not have democratic rights. "They have no means to express themselves, and they don't have a voice in real terms. "The only way we can, as minors, express ourselves is through demonstration." But the school said the pupils were suspended because they had incited others to stage a walk-out, breaking health and safety rules and the school's behavioural policy. Headteacher John Steel said: "Prince Henry's Grammar School has a legal duty of care to its 1,360 students, and we must ensure the health and safety of our students during the school day. "The school cannot advocate or legitimise actions that could put students at risk, and prevent us from exercising our responsibilities." He added that while the pupils' political beliefs were valued, the curriculum provided the proper channels for the expression of those beliefs. Mr Steel added: "We value the conviction of the two students concerned, and respect the views of all members of our school community, but we cannot sanction protests during the school day when students should be in lessons."